Meet up at the RAM. Since the first meet and greet was fun, lets see if it can be brought up a notch. Like what was done a few years back, this place is next to the HD place off Marvin Rd. Called the Ram Restaurant. 8100 Freedom Ln. NE, Olympia, WA 98516. off exit 111 on the south side of the freeway. Lets see how this one goes. Next Tuesday the 3rd of May 6ish pm. It would be fun to get as many as possible here, maybe a regular spot? I also hear it's suppose to be pretty darn nice weather wise. So don't be shy, swing on by and say hello, besides, they have great food too. Jay, This looks like another great location for a meet-up, Sounds like a plan....Summer weather, I'm in. Yea My thoughts too.. come on guys lets hook up and have a good time. Bring the girl friend, wife, significant other, kids too. it's all good. Looks fun, I should be able to make it. Don't know any of you, but wouldn't mind meeting a few fellow riders. Does everyone meet up outside or is there a section inside where everybody will congregate? I will be in beautiful Dayton Ohio this week, or I would try and make this. We kinda hang around outside till there's enough to warrant taking over the patio area. Why I like this spot keeps the bikes close by. Might be down for this. My wife has family in Olympia. If I bring her, we'll be in the pickup. Haven't been to the Ram in ages. The bread pudding was awesome last time. It's all good, one,tow or more, it's still good. besides that, they have a good bread pudding. It's all good, one, tow or more, it's still good. besides that, they have a good bread pudding. oh too funny, gota love miss spell checking... "two"
Ran home for lunch quick, and Wife is planning out a menu to cook with Sister. Pad Thai, rice and avocado something or other, raw this, vodka that... Knock yourself out lady, I'll get a hamburger and a beer. That was fun.. lets do it again.. forgot just how nice the Ram is for this sort of gathering. Another excellent choice Jay, Iove that place, the food was top notch, and most important the group of riders in attendance. Look forward to our next outing. Thanks Dan for the photo. Yes sometimes simple is the way to go.. A good bunch that had a bit more in common than I expected, being we have never met. 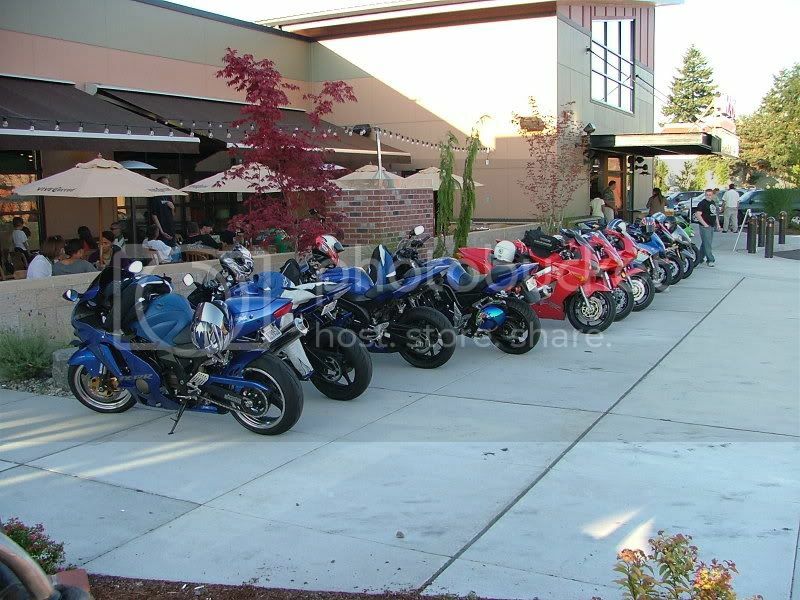 It's what this motorcycling thing does huh, getting good people together.